Today, we recycle used soda bottles, unusable manufacturing waste and worn-out garments (including our own) into polyester fibers to produce clothing. And we offer recycled polyester in a lot more garments, including Capilene® baselayers, shell jackets, board shorts and fleece. Using recycled polyester lessens our dependence on petroleum as a source of raw materials. It curbs discards, thereby prolonging landfill life and reducing toxic emissions from incinerators. It helps to promote new recycling streams for polyester clothing that is no longer wearable. By recycling old products, we can keep many of the same materials in circulation for years. In 2005 we began taking back worn out Patagonia clothing for recycling. 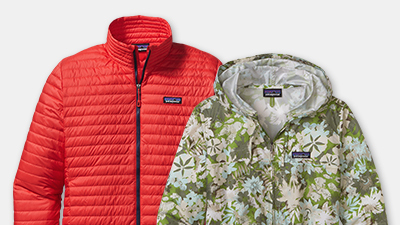 Today, you can return any Patagonia product to us and we will reuse it, recycle it into new fabric or make it into a new product.